From Awareness to Action: FEED and Ateneo BOx Launch ECOSURF Program | FEED, Inc. Article produced courtesy (thank you!) Camille Pilar, Writer/Editor at LU Soul & Kudo Surf Community; Writer at Writing True; and co-creator of Clean Beach. 10 Nov 2018, Urbiztondo Beach, San Juan, La Union. A group of 93 students from the Ateneo de Manila University (ADMU) ventured outside of the four walls of the classroom to experience conscientious environmental education during the launch of ECOSURF, a program designed to provide sustainable solutions for climate change, last November 10, 2018, at Urbiz Garden Plage in San Juan, La Union. for the environmental sciences is widely known in the Surfing Capital of the North. Acknowledging First our amazing ECOSURF Launch Partners & EcoWarriors! ECOSURF is a program conceived by 3 La Union Surf Club, Inc. (LUSC) certified surf instructors at Jongky Surf School: Rhea delos Santos Ventura (co-founder of Jongky Surf School), Diane Penales (FEED VP of Operations) and Anne-Marie Mananquil Bakker (FEED Director of Partnerships). ECOSURF’s logo was also designed by local resident Charisse “Chat” Palmos, who has an established reputation in branding, marketing and communications. ECOSURF is a truly collaborative undertaking that also aims to feature the multi-disciplinary talents of La Union’s local (surfing) community. The program was then formally designed by Fostering Education and Environment for Development, Inc. (FEED) and its first launch sponsor was Ateneo Biological Organization (Box), ADMU’s premier student organization dedicated to the biological sciences. FEED’s program coordinators, Diane Penales and Anne-Marie Mananquil Bakker, are known for their work with student organizations when not riding waves in San Juan. ECOSURF also bridges academic lessons to actual learning experiences such as coral propagation under Ocean Quest Global and Sea Shepherd Dive, mangrove planting with LINK (Lupon ng mga Indibidwal na Nangangalaga sa Kalikasan) and DMMMSU’s YES (Young Earthsaver’s Society), surf lessons with Jongky Surf School and other LUSC certified instructors, and Duyan Yoga with Teacher Camoi Miraflor of SIESTA. The Ateneo BOx envisions its members to become future environmental leaders through the “eXplore, eXperience, and eXcel” manifesto. Through ECOSURF, FEED and its Living Legacy partners supplied a framework of sustainable solutions to help the students deepen their knowledge and understanding of the role of coral systems in climate preservation, the importance of mangroves to seaside communities, as well as linking environmental welfare with individual mindfulness through surfing and yoga. ECOSURF activities are meant to develop a stronger compassion for life through social action and an overall fun day at the beach. Instead of the typical ribbon cutting ceremony, the launch was opened by a tree-planting of native Philippine chestnut trees at Urban Garden Plage, carried out by Hon. Cong. Vini Nola Ortega, with guidance from FEED Ambassador and DMMMSU Environmental Scientist, Celso Jucutan. ECOSURF program activities are meant to develop a stronger compassion for life through social action and an overall fun day at the beach. Hon. Cong. Vini also had the change to engage directly with the local surf instructors from Jongky Surf School, to hear about their recent November 5th, 2018 Coral Propagation training – the first of its kind carried out for a surfing community in the Philippines – by Laura Riavitz of Ocean Quest Global and Sea Shepherd Dive. Students from BOx were divided into groups that alternated between the different learning modules of the day. One of the presenters was Laura Riavitz, of Ocean Quest Global and Sea Shepherd Dive; she’s a surfer and marine biologist from Austria who is now living and working full time in La Union. The students listened to an introductory course on coral propagation, which was immediately followed by a demonstration. After learning about substrate and catalysts which are essential in coral growth, the students snorkeled and planted the coral fragments on the reef beds of Urbiztondo Beach. Parallel to the coral propagation module, other groups took a beach cleanup walk towards the shore to take part in Surfing 101 with LUSC instructors, receiving first a land safety training then getting stoked on the water. Another module was on mangrove planting, which was led by Celso Jucutan, an educator from DMMMSU and leader of the LINK volunteer groups. The students from ADMU also interacted with the students from DMMMSU’s Young Earthsaver’s Society (YES) as they looked for spots along the beach where the baby mangroves could grow. During his talk, he quoted leading academic, science broadcaster and environmental activist Dr. David Suzuki: “Planting native species in our gardens and communities is increasingly important, because indigenous insects, birds and wildlife rely on them. Over thousands, and sometimes millions, of years they have co-evolved to live in local climate and soil conditions”. The ECOSURF participants also learned more about La Union and its thriving community of eco-minded individuals through stories shared by Tina Antonio, founder of La Union Soul and venue partner Urbiz Garden; and FEED Ambassador (“Protector of Turtles & Trees”). After each lesson, the students tested their balance during an hour of surfing with the LUSC instructors. Other than speaking about LU Soul’s and various La Union community organizations working with CURMA (Coastal Underwater Resource Management Actions), Tina focused on the significance of working together for the protection of our environment, and thanks all ECOSURF launch partners for pioneering this program. The final session was yoga led by Camoi Miraflor of Duyan Yoga to finally calm the mind and body after a physically demanding day. As the various activities commenced, the students regrouped to have lunch together with their instructors and co-participants. The meals were done boodle-style, cooked by local La Union food joints such as Nak-Nak’s, Mamba’s Kitchen, and Aling Norm’s, and eaten with bare hands in “Boodle Fight” style. It is through these activities that students get a complete experience of the biodiversity and beauty of the natural environment. After having planted new corals and mangroves along San Juan, the students from BOx will one day return to check on their contributions to managing coastal health. 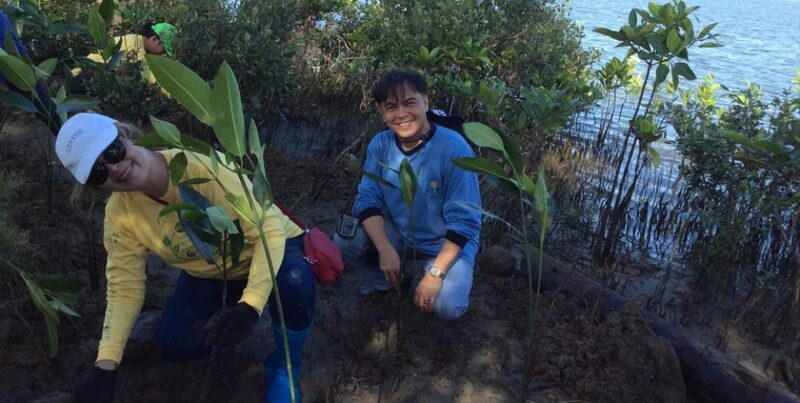 Like the corals and mangroves that they planted, participants too will experience a new kind of growth. After all, it is not only knowledge that is essential in action, but more importantly, compassion– for one’s self, for the environment, and for others. All instructors and participants were awarded with Certificates of Participation, paying tribute to their pioneering drive towards making the ECOSURF launch a success for all. These values are aligned with the core principles of Ignatian spirituality, which is one of the pillars of an Ateneo education. By fostering a “man for others” mindset, the ECOSURF participants are able to carry with them the learnings and the joy of spending a day with nature, rehabilitating what is lost, and finally grounding oneself and finding one’s place in the world while enjoying the feeling of riding a wave. Thank you Ateneo BOx EcoWarriors! May the Coral Forest be with you Always! Thanks to the ECOSURF EcoWarriors Launch Team! Thanks to LUSC Surf Instructor EcoWarriors! Mother Nature asks: Are you Ready to Evolve?